Brauhaus Schmitz saved their best Oktoberfest for last! Following their largest South Street Oktoberfest in ten years, Doug Hager and the Brauhaus team are back again for the 3rd Annual 23rd Street Armory Oktoberfest, on Friday, October 5 and Saturday, October 6, 2018. Staged in the sprawling 23rd Street Armory, the Armory Oktoberfest includes three sessions, each able to accommodate 1,500 revelers, for one of the biggest beer-drinking events to hit Philadelphia and one of the most authentic Oktoberfest parties in the United States. Tickets are on sale now and include music, dancing, food, drink and much more. Prost! Break out your lederhosen and dirndl! 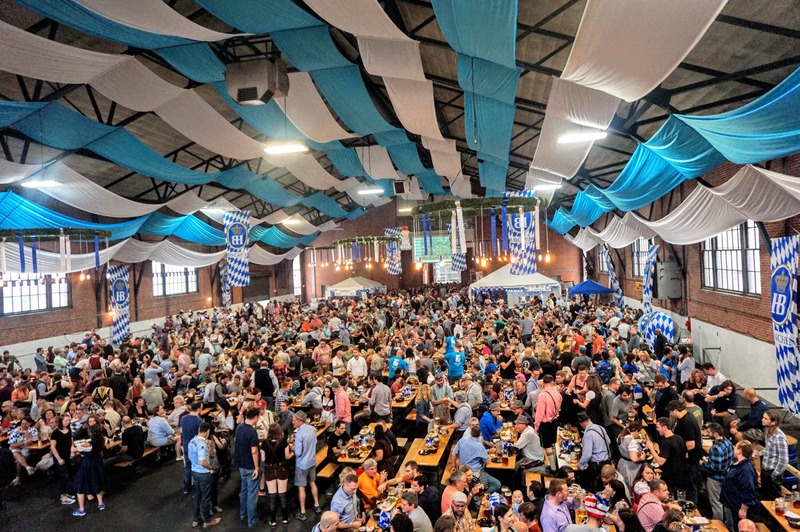 Brauhaus Schmitz will transform the fortress-like structure located at 22 South 23rd Street in West Center City (only a 5-minute walk from 30th Street Station) into an authentic Munich festival tent. The 16,000 square foot space will be decked out with Bavarian blue and white ceilings, authentic festival tables and benches imported from Germany, as well as a lofted stage area for musical acts, which will include the Brauhaus regulars The Heimatklange Band Friday & Saturday night and Melina & the Oompahs on Saturday afternoon. Beer for 2018 will be provided by the world famous Paulaner Brauerei München. Traditional Oktoberfest food will be provided by Brauhaus Schmitz’s Executive Chef Valentin Bay. His menu will include pay-as-you-go items such as sausage sandwich or roast pork sandwich served with sauerkraut, sausage or roast pork platter served with sauerkraut and potato salad, curry wurst platter, french fries and more. Sausage choices include Bratwurst (pork, marjoram, caraway, mace) and Beauernwurst (hickory smoked pork and beef, garlic, pepper, mustard seed). Guests can also indulge in a separate stand for pretzels and cookies. VIP packages also contain elevated food selections included with the ticket price. General Admission tickets are $25 each and include open seating on imported festival benches, pay-as-you-go traditional Bavarian food, first liter of beer, one large Bavarian pretzel and access to music and dancing. Table service will also be available this year in Genera Admission. VIP tickets (for groups of 4 or 8) are $65 each and include reserved seating, table service, glass liter mug, two liters of beer, private bathrooms and one food ticket good for a entrée platter. Choice of sausage, roast pork or ½ chicken with sauerkraut and potato salad. Please contact Brauhaus Schmitz for parties larger than 8 for group sales. Uber VIP tickets (per person minimum of 8) are $85 each and include reserved seating, table service, glass liter mug, two liters of beer, private bathrooms, two brotzeit boards, schlachtplatte (unlimited additional food) and two schnapskis. For the table: Brotzeit Board – A selection of meats, cheeses, radishes, bread, pretzels, and accompaniments. Schlactplatte- whole roasted chicken, roast pork, four sausages, sauerkraut and potato salad. Schnapskis: herbal German liquor shots served on a ski, taken in groups of four. Please contact Brauhaus Schmitz for parties larger than 8 or Groups of four. Groups of four may be accommodated based on demand. All tickets are on sale now at www.brauhausschmitz.com/events1. Note: All VIP and Uber VIP tickets are now sold out for the Saturday afternoon session. VIP options are going fast for the Saturday evening session. For more information, visit the above link or call Brauhaus at 267-909-8814.